Common Core geometry is rather simple in first grade, but there is an important twist that you may not notice. Students identify, explore, and work with shapes, which is the simple part. The twist? They work with defining attributes. Defining attributes basically means that they begin to pay attention to what makes a triangle a triangle, not just what a triangle looks like. When your child was very young, you probably read a number of shapes books with him. A typical shapes book has a page for a triangle with a number of different triangles scattered around the page. These triangles may have been colorful, and they may have been seen in everyday objects (a sandwich, a window, a pizza slice). Almost certainly, these triangles have one side parallel to the bottom of the page. What children tend to learn from these books is what a triangle looks like. A triangle looks like a sandwich cut in half, for example, which is important. The next step is to learn what makes all triangles alike; namely that they have three sides. It’s not looking like a sandwich or pointing up to the top of the page that makes a triangle a triangle. A triangle is a triangle because it has three sides and three corners. So expose your child to a variety of triangles in different orientations and talk about whether they are all triangles. 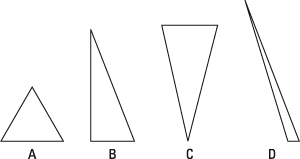 For example, many children will say that shapes A and B in the figure are triangles, but that shapes C and D aren’t. These children are paying attention only to the look of the triangle, not to its properties. Here’s an exercise you can try: Sit across a table from your child, each of you with a pile of blocks. Build a simple building (maybe three blocks high and one block in front). Have your child copy your building. Pay attention to how he builds his. Where does he put that fourth block? Is it in front from his perspective or from yours? Take turns building, copying, and talking about how your results are alike and different. This exercise is good and fun spatial visualization practice. First graders go beyond naming shapes in order to understand their properties and to build and imagine with them. Doing so builds a foundation for thinking about categories of shapes in later elementary grades, where students figure out whether a triangle can be both right and obtuse.